With more than three years of experience in running, I have been a beneficiary of help from friends, social media friends, veteran runners, elite runners, and even strangers. They’ve helped me conquer the first step to my first 5k to the 160th step to my longest ultramarathon. I am sure everyone can relate to this. It would take forever to be able to thank all of them. And the only way we can really thank them is by completing the cycle. I have always tried my best to share my experience thru posting it here. I would willingly answer querries from friends and acquaintances and try to answer them or refer them to an authority. I have enjoyed running and pacing friends in their training runs and races including the 2010 and 2011 TBR Dream Marathon. It is my way of Paying it Forward. For those two years though my duties as pacer and cheerer for the Dream Marathoners would end as soon as the friend I am pacing have crossed the finish line. 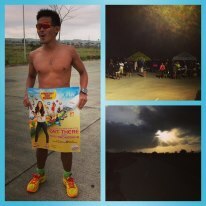 Runners are already on their last 5K when they reach the tent. Most of those running back by the time I reach the place are on their last 1K going for a sub 6 while those arriving still has about 4K to go. I guess even elites who finishes a marathon in sub 3 hours are in pain on the 38th kilometer, moreso, most of these runners who will finish between 6 hours to the cut-off of 9 hours. The KIKAY Tent – Need I say more to describe it…. 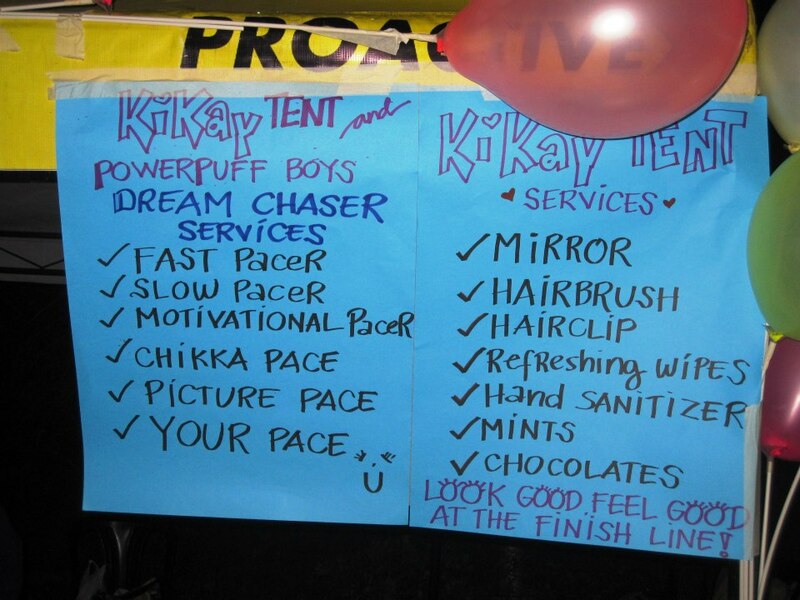 The Kikay Tent with everything you need to finish strong! 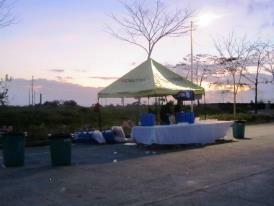 There are other aid stations along the course, almost every 1.5 kilometers. Tent of Dream Chasers abound also cheering, offering food and drinks. Some of them would run with you or walk with you. 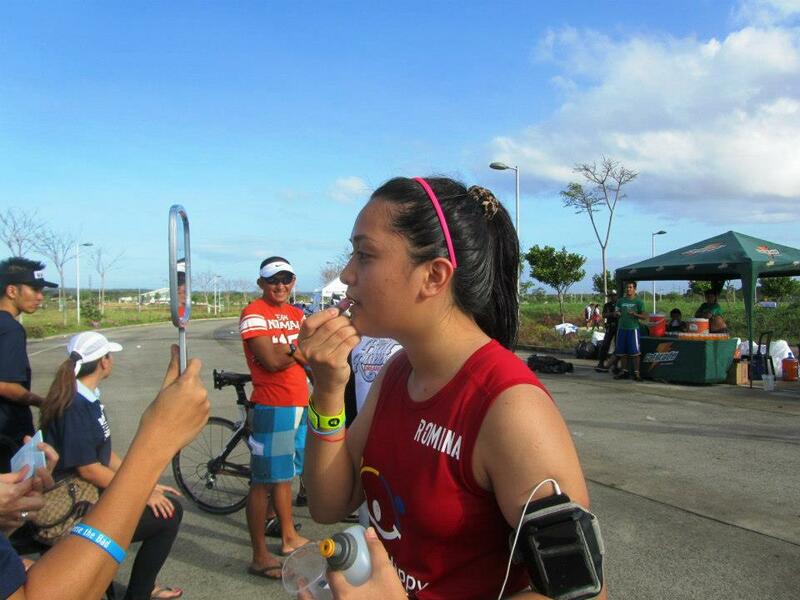 You’ve probably ingested all sorts of sports drinks, gel and water at this point. 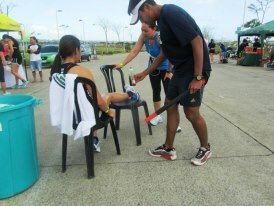 Now, the brilliant guys at this station brought several liters of Pepsi to give the runners the energy boost they need. It does magic at ultramarathons for veterans Mark and other TPPB so why not share with the Dreamers. That’s bartender Mark Hernandez of Team Gotta giving out Pepsi. As for me, I am not sure what I was singing errr I mean what am I doing here..?. Just tell them you need a massage and they would willingly do it for you. 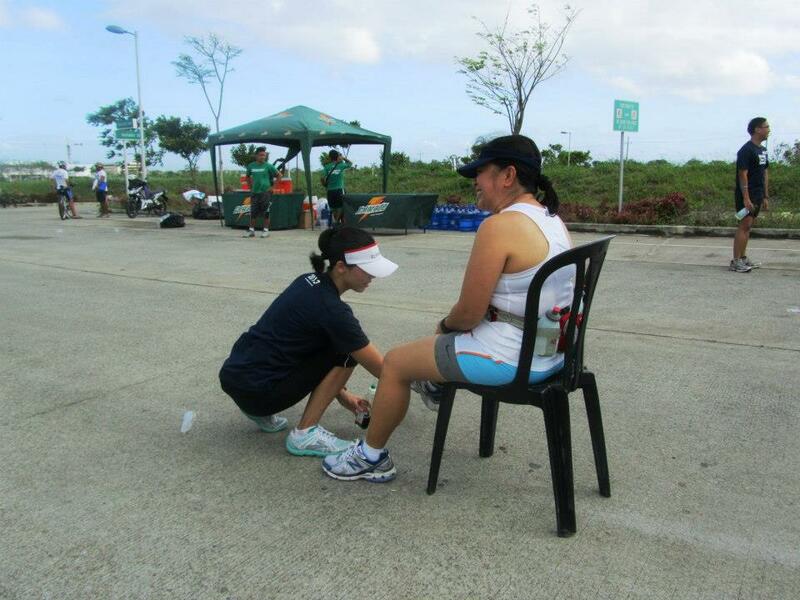 I got the chance to help massage about two runners and it wasn’t easy task yet it was fulfilling seeing their face brighten as you relieve them of the pain. Hats off to Bea, Ronnel. Odie, Natz and others who stayed longer than me and have been doing it since 2am. You will only have one first full marathon finish and you have to be ready (and good looking) for it. Almost all runners stopped and freshened up at the last station to the finish line. Yes, there are mirrors and lipgloss but this girl is our favorite. She’s ready with her own lipstick. 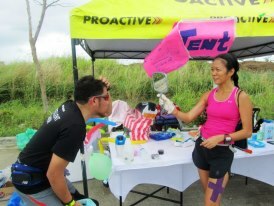 I paced my friend JM Mina when he reached the tent and made sure he was well-groomed for the finish line photo. 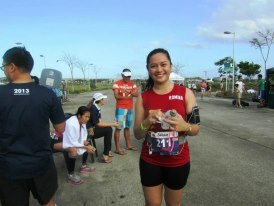 As much as I still would want to stay until the 9-hour cut-off, I had to go and run with JM to the finish or else I might need to run back alone to Manila. 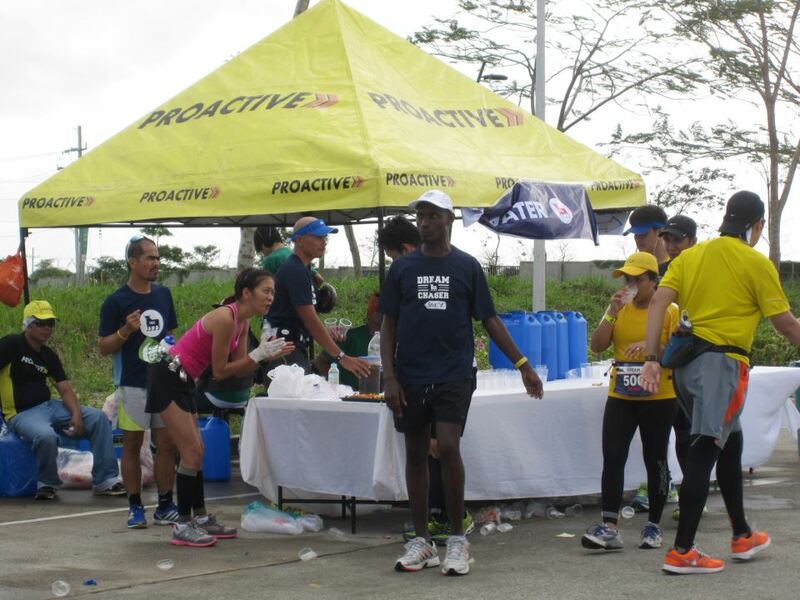 The Team stayed until the last runner has passed the tent….and chased her until she crossed the finish line with 3 minutes to spare. 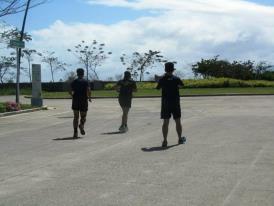 Joanne Tan being chased by veteran runners on the last 1k to her Marathon Dream. 584 Dreams were fulfilled on that day at The Bull Runner Dream Marathon. I went home a better person.TBR Dream Marathon gave me the chance to 1) run without focusing on myself but on others; 2) give rather than take; and 3) be joyful as I help out strangers. Congratulations, Jaymie and Team! It is an event that allowed runners to dream of becoming marathoners and at the same time allowed veteran runners to PAY IT FORWARD.